I just wanted to give everyone an update on our car fan blade injured cat Sealy. It's been a little over a month since we brought him home. It's hard to believe he's been with us that long. 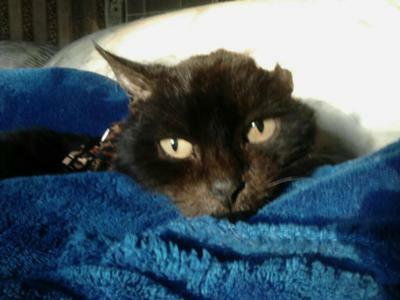 I hope Sealy's story will give hope to those of you whose cats ever face a critical injury. The links to his previous stories can be found at the end of this update. The deep cut into Sealys head has sealed itself shut. I would imagine more than one of the blades hit him since he has two injuries. Although the gill-like cut has closed over, his head around the injury site is still a major concern. The site has gotten larger and we believe it began itching and Sealy scratched at it. The skin does appear to be thickening up trying to heal. There are little crusty scabs around the edges. The shelter as well as the vet advised us not to use a bandage on it and to keep it clean. Using a bandage may protect it from injury, but it also invites infection. If it comes down to it, we'll come up with a way to cover it. I can get creative with an Ace bandage and non stick pads. Sealy can't wear a cone as this would rub against the injury. It's also not feasible to put any kind of numbing medication on it since it could lead to Sealy injuring himself while washing up. This could also be the cause of the actual sore getting larger. Sealy is a very diligent cat when it comes to grooming himself. We now have him on 5 mg. Predisone to help with any irritation. We hope this will stop any itching he's experiencing. Last week we received his walking jacket from www.castlepaws.net. He didn't mind us putting it on him. It was a good fit and we'd planned to walk him over the weekend. It rained on Saturday, so he only got to wear his new cat jacket while he lay on the couch. We began Sealy's emotional healing on Saturday. He lay on the couch on his blue blanket with his jacket on. He only lay there a few minutes the first time before he decided to get down and jump back in his cage. He can jump the three feet from the floor into his temporary home. And he DOES consider the cage his home. He's escaped one time while Laura was cleaning his cage and showed her how quickly he could run behind the old TV his cage is on. Laura was able to reach him and he was content to go back in the cage. Laura has developed an excellent way to clean his cage without too much fuss. She will lift Sealy out of his cage on whatever blanket he happens to be laying on. He goes into the small feral box he came home in. It has a plastic slide down the front so he can watch her change his bedding. After his cage is disinfected and fresh bedding put down, she'll lift him out of the feral box and allow him to jump over onto the new bedding. Both of us sustained a lot of scratches before she came up with this idea. Sealy has become spoiled to baked chicken broken into tiny bites to accommodate his lack of teeth. He no longer waits fifteen minutes to inspect his treat. He comes right over and eats. Especially if I wave a piece of it under his nose first! He also enjoys steamed squash and deviled egg yolks. I believe we've put some weight on him this past month. Last Sunday I attempted to take him for his first outside walk in his new cat jacket. BAD idea. I put him on the ground at the bottom of the steps. He decided he wanted no part of the outside world and climbed the steps wanting back inside. So I took him to the middle of my yard. He made a fast walk to my car and tried to crawl under. By the time the walk was over, Sealy had knocked a piece of his scab off. We won't be trying outside walks again for awhile. Sealy seems fine staying inside. He now lays on the couch each night between us. As long as he has his favorite blue blanket he's happy. Sunday night he lay beside us for at least three hours. Midnight curled up with him at one point. With a little coaxing from us, of course. 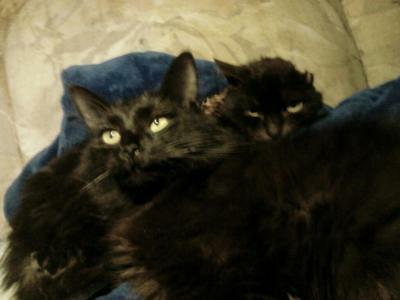 Since Sealy is a black cat, I knew from experience he'd want another black cat as his friend. Sealy must have enjoyed the company as he didn't get up and leave. Monday night Sealy was laying on his blanket on the couch and he really looked at me for the first time. He just kept staring at me as though he'd never seen me before. I believe we crossed a bridge Monday night as he lay there. He decided his new life with us is good. I could almost hear his thoughts in my head. "Hi mom. I think I'll lay here with you awhile." After a month with us, Sealy finally appeared content. Tank, the cat who was with Sealy at the time of his accident, became sick and died at the shelter before his rescue was finalized. A friend of mine was going to foster him, but had to wait until she had a space for Tank. The difference between Sealy and Tank is Sealy knew he was loved. Tank sat alone in a cage. He was cared for at the shelter. It's not the same. I believe love is what's pulling Sealy through this. Love and a very clean environment. His soiled bedding is changed several time a day. His day always ends with his favorite blue blanket. I plan to take him back to the vet for a checkup within the next week or so. I want to know how much weight he's gained and I want an estimate on his age. I believe he's an older cat, and the vet he will see next time is the best vet I've ever used with my cats. I also want an estimate on a timeline for his healing. Personally, I believe he'll have a scab on it for five months or longer. I wish I was wrong, but I don't think I am. It's a horrible injury. We're thankful there's no infection. Is Sealy spoiled? Maybe just a WEE bit. I've started writing a book on our "Prince Charming." I hope to have it done in just a few months and I hope you'll all read it. I plan to do it as an ebook and I'm currently checking into which distributor is best for it. 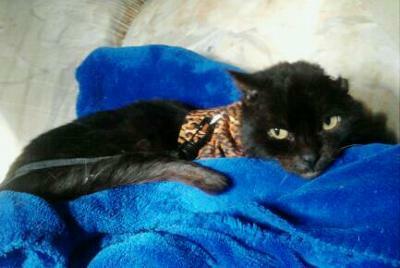 For those of you who would like to follow Sealy as he heals, he's on Facebook at www.facebook.com/prayersforsealy. Sealy looks like Monty, except for his missing ear. When I first took Monty outside he reacted in fear too and immediately wanted inside. I think Sealy already knows his life is better inside with you and he's afraid you are going to put him back outside to fend for himself. He doesn't want that. Monty cried loudly his first few times outside and would cling to me. I remember being on my hands and knees next to him in the back yard and he jumped up on my back and meowed loudly. I was questioning whether he would ever enjoy the outside and if I was just traumatizing him needlessly. But once he realized he was not going to be left out there, that he would be coming back in with me, he started to enjoy exploring the outside. Now it's just part of his day to enjoy a little outside time-- but he has a very definite territory. Though he could easily climb over the wooden fence around our yard, he doesn't. He will walk around the perimeter of the yard sniffing everything before coming inside. He makes the rounds, checks on his territory. I think eventually Sealt may develop a pattern like that in outside walks with you, but it will take time. Since he was feral I think it is the right thing to give him the outside experiences as he becomes ready. When he knows he can always come back in he will start to enjoy the outside with you. Thanks for the update. When Sealy looked at you intently he was connecting with you and it was a demonstration of his love for you and the caring that you have given him. I am sure this is true. He is opening up gradually and beginning to get over the trauma of the accident, it seems to me. It is a very informative article on how to care for a badly injured cat.